Photographs of the Three County Fair by Stan Sherer are on exhibit until May 2nd at Historic Northampton. The exhibit, Fair People: Continuing a Tradition , show photographs taken in 1988 while Stan was fulfilling his Copeland Fellowship at Amherst College. They were then exhibited that year for the first and only time, until now, in the Robert Frost Library at Amherst College. These photographs exemplify traditional documentary photography. Stan was a freelance photographer for the Three County Fair from around 1983 to 1988. Film was used to capture the images at the Fair. Stan then processed the film and printed them in his darkroom, a technique now often referred to as analog photography. Most of the photographs in the exhibit are vintage silver prints. There are four digital prints of Stan's work in the exhibit. They are larger than the vintage prints and offer another perspective which complements the exhibit. Mr. Sherer no longer prints in the darkroom. All his printing is now digital. Every picture tells a story. 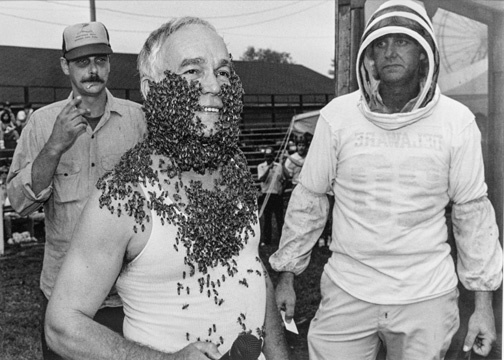 One of the photographs is of Frank Lagrant, wearing a beard of bees. Frank became a beekeeper to help overcome his fear of bees. He went on to become a prosperous honey producer. Another photograph shows Art West wearing a hat while milking a cow.The West family farm goes back to 1807 and the barn is over 200 years old. Art's father Ozzie began showing cows 60 years prior to the 1988 exhibition. 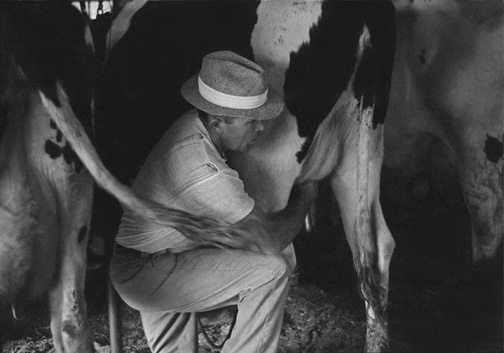 The photograph of Art West milking a cow took on a new life when Art and his wife unexpectedly entered the gallery during the opening reception. Stan Sherer was excited and happy to see him. Introductions were made, stories told and we all got to meet the man in the picture. 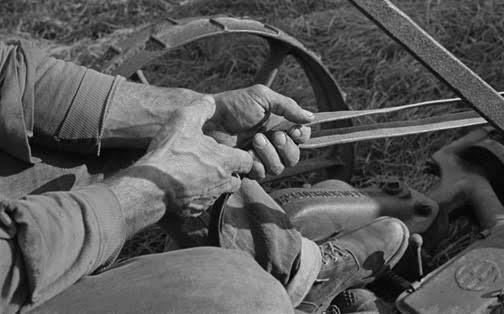 Mr. West paced back and forth along the gallery walls as he pointed out the people he knew or remembered from the Three County Fair. The audience was captivated by this wonderful addition to the exhibit. The opening reception was attended by a number of photographers, including myself. Some knew each other while others met for the first time. There was a sense of community surrounded by all this photography. Looking at vintage silver prints here in the valley was a treat. Stan Sherer's photography was classic documentary work and should be seen by anyone who truly loves photography.